Point Roberts Things To Do - Schedule Your Flight! Point Roberts Things to Do – Plan Your Trip! Planning on taking one of our scheduled flights to Point Roberts? Are you heading to the Point Roberts Marina for a trip to the Gulf Islands and interested in things to do in Point Roberts too? Well either way, we have some great ideas for you! Point Roberts has 4 public beaches which are accessible and enjoyable all year long. Don’t miss the Lily Point Marine Reserve. The reserve features forest trails and natural beaches on one of the most complete and significant ecosystems in the Puget Sound – Salish Sea region. There are public restroom facilities at Lily Point Park and a new trail leading down to the beach! Another not to be missed beach is the Lighthouse Marine Park. 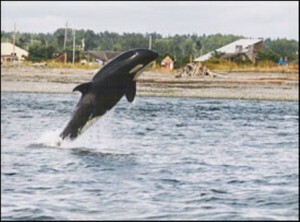 The 21 acre park, Lighthouse Marine Park, has become known as one of the best places to view Orca whales from the land and offers 30 camping sites along with a group camping site as well. Several Orca pods come by the West and South shores on their regular route in the Salish Sea. You can not only easily see them and photograph them from the shore, you can hear them sing as they come by. If you don’t spot an Orca, you will surely spot some beautiful birds and eagles. 147 species of birds come through Boundary Bay and Point Roberts as part of the Pacific Flyway. Training for a triathlon or just looking for a great bike ride without a lot of traffic? Because of the hilly terrain, beaches and trails, Point Roberts is a favorite training ground for triathletes. There is local rental company that has bikes available for you. You will find over 12 miles of trails for your hiking and trail running adventures. Love to boat, sail or kayaking? Be sure to check out Point Roberts Marina for more information on all Point Roberts has to offer to boaters! For years Point Roberts Marina has well-served boaters traveling through the Pacific Northwest; offering a safe place to moor in its well-designed marina, perfect weather and ideal locale. Now, with scheduled flights from Bellingham, you can fly to Point Roberts Marina and avoid the border crossing hassle and be there in 20 minutes! Don’t worry, you won’t go hungry in Point Roberts! You will have dining options from fine dining and seafood on the beach to fresh breakfast and coffee. And if you are looking for a festival, check out the Point Roberts Arts and Music festival which is usually the first weekend in August. Their 4th of July Parade is a local favorite in Point Roberts and to honor their Canadian neighbors, there is a bonus day of fireworks and fun on July 1st – Canada Day! Truly a “US-Eh”weekend. The Point Roberts Golf and Country Club is one of the best courses in the Lower Mainland if not the Pacific Northwest. 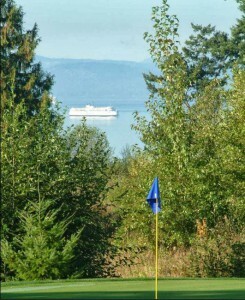 The course is cut through the forest with views of the ocean distracting your eye on several holes. It plays between 5,144 and 6,868 yards depending on the tees and will challenge the potential of every golfer. Graham Cooke and Wayne Carleton have designed a course that flows through the land while taking care not to disturb the natural beauty and wildlife. Passing through the entry gates to the Point Roberts Golf & Country Club, you quickly realize why it ranks 6th in the entire United States for unique golf courses. They have also been recognized from within the golf trade as the 2003 Best New Affordable Course, and recently added to the Golf Digest Best Places to Play list for 2008/2009.